:- use_module(library(clpfd)). this statement is used at the beginning to import the all_different/1 predicate. This predicate is used instead of fd_all_different/1 to check if all list elements are different. +Vars ins +Domain is used instead of fd_domain/2 to validate the domain of list elements. Rect1, Rect2, Rect3, Rect4, Rect5, Rect6]). Overwriting an entry of the .dtors section, which contains a list of destructors, each called subsequently before program termination. Overwriting an entry of the .plt/.got sections, the dynamic linking structure which resolves the position of shared library functions such as exit(). I guess the original intent to solve this level was to use the first approach, induced by the suggested reading material. In the mean time, the vortex wargames have been recompiled with a newer version of gcc and unfortunetaly, the .ctors/.dtors sections are no longer writable, as mentioned by the vortex admins. In a second notice, they suggest to brute force the 2^16 possible values and draw own conclusions. This resulted in 3 address values which led to a successful exploit: 0x0804928c, 0x080492cc and 0x08049306. Interestingly enough, these memory locations originate from a read/write memory location, where the program text is loaded. But the program text is actually executed from the 4k memory region starting at 0x08048000. Comparing the dumps of both regions 0x08048000-0x08049000 (read/execute) and 0x08049000-0x0804a000 (read/write), I realized that they almost match, the only differences several are unitialized memory addresses in the latter. From there on, I started reading about the loading process and dynamic linking in order to understand the meaning of this memory layout. I concluded that the raw program text is loaded in the higher memory region. During initialization, the loader copies its contents and completes missing references to several dynamic process structures such as the .got and the .plt starting at 0x08048000. Following the pointers from 0x0804928c, we see that it leads to the .plt at 0x0804962c (exit@got.plt) and eventually to the exit() function from the dynamically linked libc at 0x0804830a (). Following the double indirection (**lpp), the .plt entry for exit() is therefore overwritten and program execution will jump to &buf instead of exit() when called at the end of the main function. 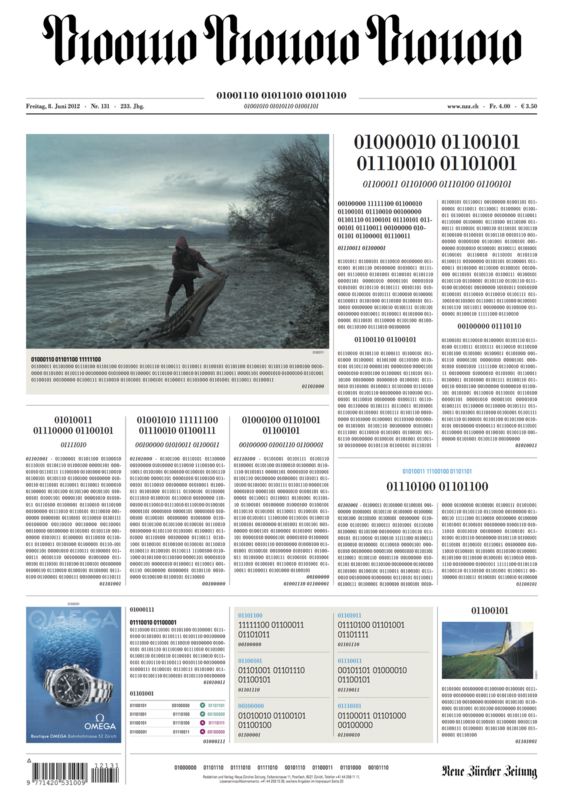 Last Friday, I was surprised to notice that the front page of the Neue Zürcher Zeitung's daily edition was scattered with nothing but zeros and ones. At first, I thought this had to be some kind of a printing defect, similar to the illegible raw output of a PDF. But then I realized that the gothic letters in the title were also affected by the anomaly; this couldn't be a mistake. As reported by several security related online portals, a file with approx. 6.5 mio SHA-1 password hashes from LinkedIn users is currently circulating the web. I could easily get ahold of a copy of that 250 Mb file through bittorrent and realized that my password matched an entry :(. As mentioned here, a subset of the hashes are marked with 00000, presumably to identify already cracked passwords. You should therefore check both variants as shown above. If your password matches, you should change your LinkedIn Password asap and then change your passwords everywhere where you reused it (especially for popular platforms like Facebook, Google or Amazon). I checked in my vortex solutions on github, check it out: github.com/antoinet/vortex.